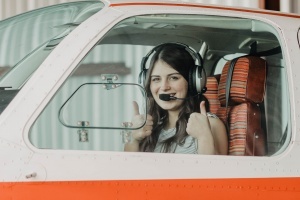 Pilot Emma Percy, 18, poses by her 1973 Bonanza V35, the plane she trains in. Q: Where did your interest in aviation come from? A: My dad does fly and I think that’s really what got me started with flying, you know just kind of being interested in that part of his life. So, he got me my first lesson (at Shelby County Airport). And after I took that first lesson, I was kind of hooked on it. It took me about a year of training to get my private pilot’s license which is the first license. Percy poses with father, Pilot Dwight Percy, next to her airplane. Q: What is it like trying to fit in flying hours while also being a full-time college student? A: In high school, it’s really hard to fit in the flying stuff, and I mainly do it on the weekends. I had to get 40 hours (to get a private pilot’s license). I play flute and piccolo at Hewitt-Trussville High School. Q: What do you see yourself doing in the future with aviation? 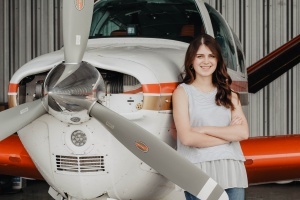 A: I definitely know I’m going to pursue flying, and I want to be a regional pilot or fly corporate. Q: Only 7% of pilots across the nation are female. What is does it feel like to be a young female pioneering in this industry that is predominately male? A: It’s definitely apparent at Shelby County (Airport), but it’s not like its devoid of women, necessarily. It was pretty daunting at first, because there are a bunch of men there. But they are really all also helpful and it really is a community. I’ve met a lot of women in aviation, not necessarily pilots, but women involved. And I think that networking really helps you to get to know those other women, because know what the aviation is like with it being predominately men. Q: Tell me about some of your favorite memories of flying. 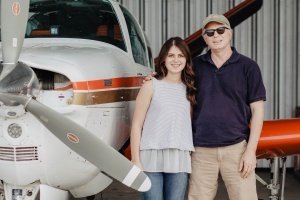 A: One really fun trip I did was one day my dad, my instructor and his wife. We flew down to The Gulf (a restaurant on the Alabama coast) for lunch, and we flew back in the same day. It was really cool because that’s not normally a trip you make back and forth in the same day. Q: How do your classmates and friends respond or react when you tell them that you fly airplanes? A: They definitely don’t believe me at first. They do the double take thing. My friends were kind of shocked at first, but they are excited for me and always ask when I can take them to the beach. Q: Can you summarize what it feels like when you are flying over Birmingham, and what that experience means to you? A: For me, flying is very freeing. There is something so peaceful about being able to just focus on my plane, the sky and absolutely nothing else. Percy gives a thumbs-up as she prepares for take-off.